Massive stone fireplaces in the lobby and lounge lend this hotel a ski-lodge atmosphere, and the condo-style suites (privately owned but put into a rental pool) can accommodate up to four people. All units have couches and kitchenettes separated from living areas by bars with high stools and are also equipped with Wi-Fi and flat-screen TVs. The roomiest accommodations are on the second and third floors; the suites in the building's rear overlook the slopes. Check the website in winter for combo ski and lodging deals. While spacious, the decor leans toward generic hotel styling. However, the suites are spacious. The master rooms contain a king bed and the living area has a pull-out, queen-sized sofabed. The kitchens are fully furnished with cookware and dishes. Bathrooms are standard contemporary spaces (think mid-range or budget hotel chain) with white or beige features. Some have dual sinks. While a massive fireplace decorates the lobby and lounge area, during peak summer and winter seasons the spaces are crowded and too noisy to sit and relax. A heated outdoor pool is open 3/4 of the year, or until temperatures fall below 25 degrees. Spa services can be arranged via a local spa, but advanced booking is required. There's a small workout room on site with cardio equipment and weights. You'll find several restaurants on-site, including John Harvard's, a regional chain serving New England classics like fish + chips and burgers, as well as Christiansen's Tavern where you'll find pub food and a lengthy beer list. The Country Store serves takeout all day and acts as a mini market where you can buy everything from snacks to sunscreen. YOU SHOULD KNOW Breakfast is not included in the stay. Beer, wine, and cocktails can be found at John Harvard's and Christiansen's. During peak ski season there are additional lounge areas serving drinks. 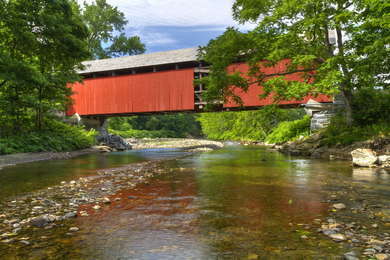 You'll need a car to access the sprawling towns and attractions in the Berkshires. While great for ski getaways, the mountain lodge is secluded and most restaurants are quite a drive. The closest is Old Forge (15-minute drive), a casual joint serving classic New England and pub food in a restored barn. For more upscale digs, District Gastropub (25-minute drive) offers upscale tavern food--think cheese boards, gourmet fried chicken sandwiches, and smoked gouda mac + cheese in a refined yet casual atmosphere. Your best bet is to drink at John Harvard's or Christiansen's both on site. If you are looking for a night out, Regions Wine Bar + Nosh (25-minute drive) offers a long wine list, craft beers and small plates to nibble on in a sleek and ultra-modern space. The complex feels like a small village and acts as a self-contained unit with restaurants, bars, and outdoor activities, making it perfect for family gatherings or ski weekends.